Düsseldorf's one and only Antonelli is back again at Dreck with a lo-fi disco EP. Stefan Schwander aka Antonelli, Antonelli Electr, Repeat Orchestra and Rhythm Maker is the ultimate analogue master who never deals with CPUs or computers. He is into hardwares and tapes. His style may sound quite old school but it is the key to his unique and ever silky soft quality in sound. Only a few producers like him still uses such gruelling technics in electronic music production. Most of them left Düsseldorf and Köln for Berlin but Stefan never thought of leaving. He is for sure one of a few as the landmark producers of Düsseldorf's house music. 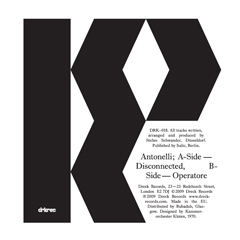 From now on London's Dreck Records will be distributed by Rubadub and all recent and old releases will fly to Glasgow while we will be listening Antonelli's new high tech disco two tracker from Dreck. "Operatore" is the answer of Antonelli towards the current nudisco trends. His way of doing music perfectly and gently matched within disco atmospheric conventions. What we hear is a perfect flowing soft killer. "Disconnected" is not very different. This time we feel more cosmic and alienated. Still melodic, groovy and still smelling like Düsseldorf. Antonalli is back as well as Dreck. Well done!